Managers who participated in a flight readiness review Monday gave approval for ground teams to continue InSight launch preparations at Vandenberg Air Force Base in California, keeping the mission on schedule for liftoff on an Atlas 5 rocket Saturday during a two-hour window opening at 1105 GMT ( 4:05 a.m. PDT; 7:05 a.m. EDT). Engineers took an extra look at data gathered during tests of the InSight lander’s heat shield after a separate team discovered a circumferential fracture last month in the heat shield for NASA’s Mars 2020 mission. NASA ordered the construction of a new heat shield for the Mars 2020 mission, which aims to place a rover on the red planet, and the replacement should be ready in time for the rover’s planned July 2020 launch date, agency officials said. But InSight, ferrying a suite of seismic and heat flow instruments to the red planet, was less than a month from launch when engineers found the crack in the Mars 2020 heat shield. The stationary InSight lander carries a thermal protection shell around half the size of Mars 2020’s heat shield, and with key design differences, but InSight was built by Lockheed Martin, the same contractor in charge of the Mars 2020 heat shield. Banerdt said Monday that engineers examined photo documentation and inspection reports to “double- and triple-check” InSight’s heat shield, making sure teams did not overlook a problem during construction and pre-flight ground testing. 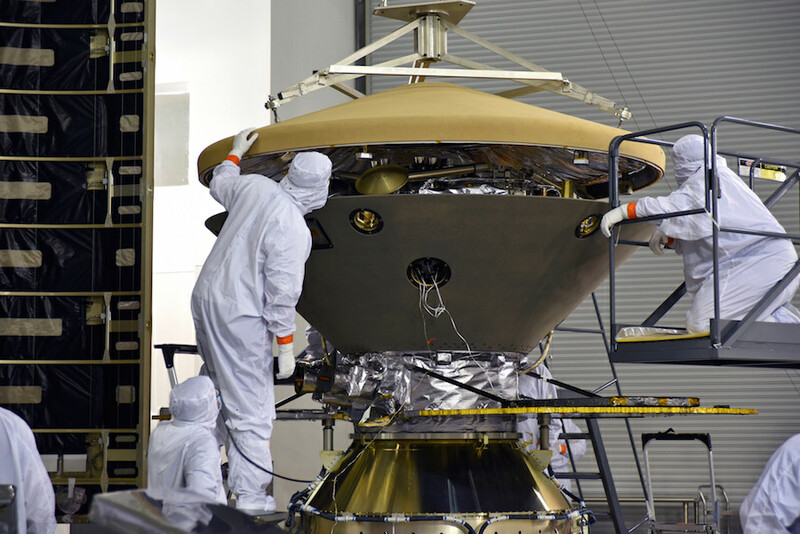 Ground crews were unable to do another inspection of InSight’s 2.6-meter (8.7-foot-diameter) heat shield because the spacecraft was already in launch configuration. The spacecraft was encapsulated inside the Atlas 5 rocket’s payload fairing 16 April, then mounted atop the launcher 23 April. “We did a complete review of our heat shield documentation,” Banerdt said in an interview with Spaceflight Now. “At this time, of course, the heat shield is not accessible for inspection, so we didn’t actually go back and re-inspect it, but we did go through the very extensive documentation we had from our testing. Banerdt said the news that Mars 2020’s heat shield was damaged during testing got his attention, but engineers soon determined the problem would have no impact on InSight. Engineers are often reviewing hardware failures to ensure they do not affect other missions carrying similar components. “You get these reports of some integrated circuit that’s failed on an existing satellite,” Banerdt offered as one example. “And you’ve got 50 of them in your spacecraft, and you have to figure out are they from the same lot? Has that been implicated? Are the uses that we have critical? Those kinds of things happen a lot. “The longer you’re on the ground, the more of those things that any space launch has to deal with,” he said. The heat shield review was “the last in a long line of those sorts of things,” Banerdt said. InSight has until 8 June to blast off and reach Mars in November. The roughly five-week launch period is fixed by the positions of Earth and Mars in their orbits around the sun. The mission was originally slated to launch in March 2016, but NASA delayed the departure after trouble encountered during assembly and testing of InSight’s seismometer instrument. Mars launch window’s come every 26 months, so the next opportunity for InSight’s liftoff opens 5 May. With the successful outcome of Monday’s flight readiness review, United Launch Alliance’s Atlas 5 team and InSight engineers planned a final countdown dress rehearsal Tuesday. Final closeouts and cleaning of the InSight spacecraft are also planned early this week to ensure the probe meets NASA’s planetary protection requirements, aimed at reducing the risk that the mission will carry microbes and other organic contamination from Earth to the Martian surface. A launch readiness review scheduled for Thursday will assess the status of the Atlas 5 rocket, the InSight spacecraft, and ground tracking systems provided by NASA and the U.S. Air Force. If the launch readiness review gives a green light to proceed, the Atlas 5 countdown will commence Friday evening, with retraction of the launch pad’s mobile gantry scheduled shortly before midnight, local time. Officials are hopeful for clear skies during Saturday’s predawn launch window, and a clear view of the launch without the envelope of ground fog that often forms at Vandenberg Air Force Base, which is located on the Pacific coast northwest of Los Angeles. InSight is the first mission to another planet to launch from Vandenberg, which typically hosts launches of satellites into polar orbit for Earth-imaging and communications. NASA’s previous interplanetary probes have historically launched from Cape Canaveral, using momentum provided by Earth’s rotation for a velocity boost toward the east. But InSight is light enough that the Atlas 5 rocket will have plenty of reserve capability to send the probe toward Mars without the help from Earth’s rotation. Once it arrives on Mars in November, InSight will place its seismic instrument on the planet’s surface to listen for quakes, and a heat sensor will burrow to a depth of about 5 meters (nearly 16 feet) to measure thermal energy coming from the Martian interior. Scientists hope to learn more about the planet’s internal structure and composition, and use that information to refine their understanding of how rocky planets like Earth and Mars formed 4.5 billion years ago at the birth of the Solar System. 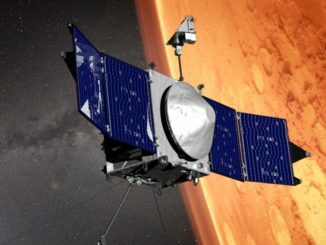 NASA is using aerobraking to lower the orbit of the agency’s MAVEN Mars orbiter to support data relay operations with the upcoming Mars 2020 rover. 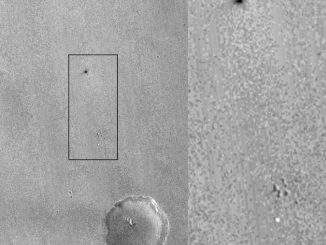 Views from NASA’s Mars Reconnaissance Orbiter released Friday show the crash site where Europe’s experimental Schiaparelli lander fell to the red planet’s surface from a height of several miles, leaving a distinct dark patch on the Martian landscape. Mars hasn’t always looked like it does today. Some 3 to 3.5 billion years ago, the planet underwent a huge tilt of 20 to 25 degrees. 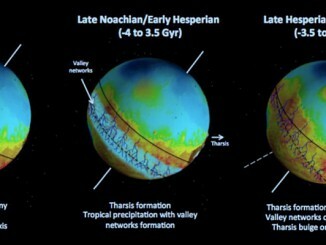 The gigantic Tharsis volcanic dome, which started to form over 3.7 billion years ago, grew so massive that it caused Mars’ crust and mantle to swivel around, shifting the Tharsis dome to the planet’s equator.